A suite of groups on the environmental movement's left flank are out with a new open letter to House members about their legislative goals around climate change. 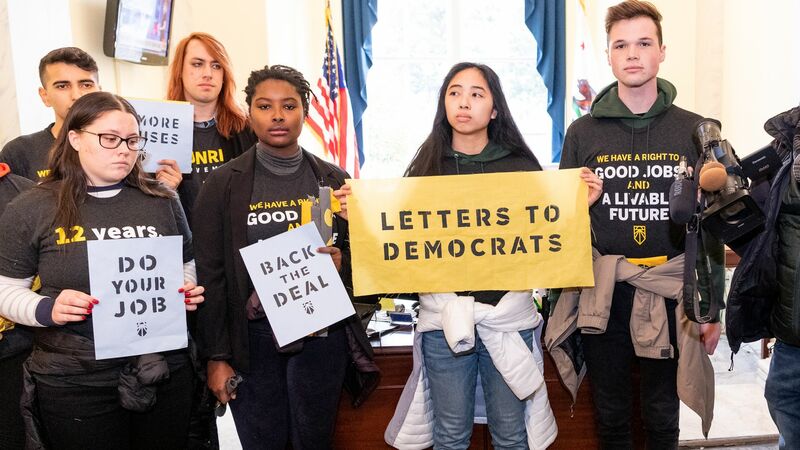 Why it matters: The statement endorsed by groups including Friends of the Earth and 350.org is an early sign of efforts to influence the shape of the Green New Deal (and climate policy more broadly). Ending fossil fuel leasing on public lands and halting approval of fossil fuel infrastructure. Moving the country to 100% renewable electricity by 2035 at the latest. Decarbonizing transportation with major investments in public transit, and phasing out sales of internal combustion vehicles. Using the "full power" of the Clean Air Act by setting strict deadlines for emissions cuts from transportation, smokestacks and other sources. The groups behind the letter include the Center for Biological Diversity, the Climate Justice Alliance, the Indigenous Environmental Network, Food & Water Watch, Oil Change USA and more. All told, several hundred groups — a tally that includes a large number of local organizations — signed on. Yes, but: It does not include a number of the largest players in climate politics, like the Sierra Club, the Natural Resources Defense Council and the Environmental Defense Fund. The big picture: It's part of a wider effort to both lay down markers and eventually craft policy specifics around the plan, both in Congress and on the campaign trail. A spokesperson for the Sunrise Movement, a group at the forefront of the Green New Deal push that also signed the new letter, tells me they've been meeting with the campaigns of 2020 White House hopefuls. The intrigue: One notable omission from the new letter is a call for carbon taxes or other forms of carbon pricing. 350.org's Jamie Henn says his organization feels the letter is aimed at promoting ideas that are often missing or downplayed in Washington. He says it's not a statement against carbon pricing, but does signal that progressives don't see pricing as the central pillar of cutting emissions to the degree needed.